Picture at top: Sea Port by Claude-Joseph Vernet, a native of Avignon. He went to Rome in 1734 and over the next decade established himself in Italy as a painter of real and imaginary landscapes based on the local countryside and seacoast. 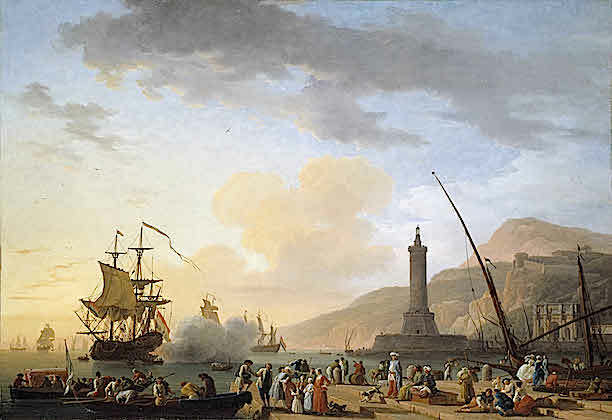 In this painting, the artist depicts an idealized Mediterranean seaport, rather than a specific location, and uses a variety of features from the region. The lighthouse is actually in Naples; the Arch of Constantine is in Rome and the lateen-rigged ship on the right is a type common to the eastern Mediterranean. The large warship fires a salute and the nearby ships fly the Dutch flag, indicating that the painting may have been commissioned by a Dutch client. This is the way of “free-towns”. The Copet Institute — inspired by Madame de Stael in the 18th century, as The “Groupe de Coppet”, led by Madame de Stael and Benjamin Constant, at the dawn of the nineteenth century, the first European think-tank dedicated to the study of freedom in all its forms — would be chuffed. The Groupe de Coppet, though reasonably elitist, focused on the problems of establishing a limited constitutional government, the issue of free trade, imperialism and French colonialism, the history of the French Revolution and Napoleon, on free speech, education, culture, the rise of socialism and of the welfare state. Singapore is a fine example of such management of issues and of an enterprising people for which the government is mostly of the people for the people. Flexible Marxism in some ways. But before this free-port found its own modern feet, its history was chequered. For example, Singapore, a British colony, fell to the Japanese on 15 February 1942, and the results were not pretty. The Empire of Japan occupied it till 1945, after having defeated the combined British, Indian, Australian, and Malayan garrison in the Battle of Singapore. The Japanese came from “the other side” of the island. The occupation became a major turning point in the history of several nations, including those of Japan, Britain, and the then-colonial state of Singapore. Singapore was renamed Syonan-to (昭南島 Shōnan-tō), meaning "Light of the South Island". Singapore was officially returned to British colonial rule on 12 September 1945, following the formal signing of Japanese surrender. The division of the Dutch colony of Indonesia and Malaysia also created tensions. On the morning of 9 August 1965, the Parliament of Malaysia voted 126–0 in favour of a constitutional amendment expelling Singapore from the federation; hours later, the Parliament of Singapore passed the Republic of Singapore Independence Act, establishing the island as an independent and sovereign republic. Singapore's bilateral post-independence relationship with Malaysia is complex and rocky at times. Despite their differences, Malaysia remains an important, albeit partial, economic hinterland and a regional ally, especially due to both their memberships in ASEAN. This importance becomes especially apparent when considering that much of Singapore's fresh water supply comes from Malaysia. Both countries have been known to chide or even issue threats to the other due to differences in paths taken after independence, but fortunately this has never become serious enough to develop into embargo or hostility. Thus countries/Cities like Singapore are vulnerable to the good or bad will of the other human communities on this planet. One thing in its favour is that Singapore, being mainly Chinese, has not had any religious aspirations that taints many other countries with wishes to conquer the world with their fiery brands of beliefs, such as Christianity and Islam — itself very important in Indonesia. Singapore does not have any natural resources worth fighting for, apart from its human capital. All these characteristics make trade and manufacture the core of the survival/comfort synergy. Buy, add value, sell at very competitive prices. Singapore cannot afford discord, poverty and gross inequality. This has been a common survival strategy to all the “free-ports”, “free-cities” that were/are not under control from the kings/emperors who through religious excuses and kingdom territory and cash envy often wished to take over. More often than not, Free-ports have “natural” defences, such as being on an island, or protected by mountains. Others (say the Cathars) created their own defences by building fortifications. Most have had access to the sea. This is a major key. Countries such as Luxembourg and Lichtenstein are landlocked and only owe their modern existence to tax-haven status. So Singapore should be an example to the rest of the world for its rigorous controls of what people can do or not. The social construct limits the number of lazy citizens. Everyone has to work within his/her capability to benefit from the city/country special status. The value of such activity is quite existentialist in its ideal. Exactly how free ports arose in early-modern Europe is still subject to debate. Livorno, Genoa and other Italian cities became famous as major examples of a particular way of attracting trade. Between the late eighteenth and the nineteenth century the existence of free ports – as specific fiscal, cultural, political and economic entities with different local functions and characteristics – developed from an Italian and European into a global phenomenon. While a general history of free ports – from their first emergence to the present-day special economic zones – has never been written, this research network aims to pave the way for such an enterprise. By communicating and integrating ongoing research efforts, and by providing research materials, scholars within different (sub-)disciplines and with interests in various local or regional cases and aspects the network hopes to promote interaction, the exchange of novel ideas and ultimately a wholly new, comprehensive and enduringly relevant understanding of the history of free ports. This is quite telling. The privilege history of Free-Ports is still to be fully written. In regard to a successfull Australia, as an independent country, a Republic shall we say, we should consider Ian Castles AO OBE (20 February 1935 – 2 August 2010) — Secretary of the Australian Government Department of Finance(1979–86), the Australian Statistician (1986–94), and a Visiting Fellow at the Asia Pacific School of Economics and Government at the Australian National University, Canberra — who was quoted by this elegant thinker, then who became a rogue ratbag, Mark Latham, in his very perceptive work “Civilising Global Capital”. Where is an Ian Castle when you need one? Mostly in Singapore, where competitiveness does not mean greed, but encouragement of a common equitable goal. For bigger countries, things are not as simple. There are the major problems of unchecked migration, which Singapore controls with an iron fist, the problem of defence, which Singapore is limiting in expenses, the problem of the environment, which for 6 million insular Singaporean is on quite a small scale. Thus the dynamics of managing an upscaled country like the USA are far more complex and less evident. For Australia, the problems are different. Most of the present governments are stupid, full of blind spots, idiotic and are partisan. they offer no proper solution towards the future and base the main added value on greed and horse-races (gambling). It’s not a panacea. Singapore became part of Malaysia on 16 September 1963 following a merger with Malaya, North Borneo, and Sarawak. The merger was thought to benefit the economy by creating a common, free market, and to improve Singapore's internal security. However, it was an uneasy union. Disputes between the state government of Singapore and the federal government occurred on different issues, especially the federal policies of affirmative action, which granted special privileges to Malays guaranteed under Article 153 of the Constitution of Malaysia. Singapore's chief minister, Lee Kuan Yew, and other political leaders began advocating for equal treatment of all races in Malaysia, with a rallying cry of "Malaysian Malaysia!" Racial tensions between Chinese and Malays increased dramatically resulting in numerous racial riots. The most notorious riots were the 1964 race riots that first took place on the Prophet Muhammad's birthday on 21 July with twenty-three people killed and hundreds injured. The price of food increased greatly when the transport system was disrupted during the unrest, causing further hardship for the people. The other major issue brought up around this time was national defence. Following independence, the British were still defending Singapore, but had announced they would be withdrawing by 1971, due to pressures at home and military commitments elsewhere in the world. This caused considerable alarm locally, particularly among those who remembered the Japanese occupation during World War II. In 1965, Goh Keng Swee became Minister for the Interior and Defence, and initiated the formation of a national defence force, called the Singapore Armed Forces, which was to be established by the time of the British withdrawal. The British agreed to postpone the withdrawal for half a year, but no longer. Singapore consulted international experts from West Germany and Israel to train their armed forces and equip them. As a small country surrounded by larger neighbours, Singapore allocated a large portion of its budget, around 19%, to defence and this still continues today, having the fourth largest per capita military expenditure in the world, after Israel, United States and Kuwait. Singapore was especially interested in Israel's model of national service, a factor in its decisive victory in the Six-Day War over its Arab neighbours in 1967. This led to the implementation of Singapore's own national service programme starting in 1967. All eighteen-year-old males would be required to participate in national service and train full-time for two and a half years, and then required to repeatedly come back each year to maintain their skills in order to carry out an effective mobilisation at any time. In 1960, a CIA agent was caught trying to buy information from a Singapore intelligence officer. The CIA offered to pay then Prime Minister Lee Kuan Yew USD$3.3 million to cover up the matter. Lee rejected the offer, and asked the U.S. to provide formal economic aid to Singapore instead. Dean Rusk, the then U.S. Secretary of State, also formally acknowledged the incident and apologised to Lee in a letter. In 1965, Lee revealed the incident in a televised interview with foreign correspondents. This led the U.S. ambassador to Malaysia and the State Department to both deny the incident, which prompted a furious Lee to furnish Rusk’s formal letter of apology as proof of the incident. Lee also warned that he would disclose further details of the incident, “which may sound like James Bond and Goldfinger, only not as good but putrid and grotesque enough”. the freeport of Hong Kong had a different problem. It was leased from the Chinese and when the lease expired it had to revert to the mainland communist dictums. This became uneasy. The Aussie “free spirit” had been cultivated as to mean “go lucky” rather than be smart. Still is the same today. Being smart in Australia rarely goes beyond finding ways to do tax dodges or go for a sickie on a Monday. This would not work in Singapore, and does not work in Australia, but considering the general “impracticability” of the purpose of education, where privileges are still cultivated by the elite through private schools, the system is of poor value. World Obesity Day isn't the most auspicious occasion but with two-thirds of Australia's adults and a quarter of its kids either overweight or obese it isn't a day we can ignore. Obesity has crept up on Australia over a number of years and is due to a number of factors. Not least among them is the pervasive influence the food industry has wielded over researchers, policy makers and consumers. Science, including health research, has been particularly susceptible to "truth decay" — a term coined by the Rand Corporation thinktank to describe the rise in use of opinion over fact in political debates and public discourse. Truth decay is characterised by increasing disagreement about facts and data, an increase in anecdotes to combat evidence and a decline in trust in experts. This enables special interests to flood individuals with filtered information. My work focuses on two key drivers related to evidence about health: industry funding for research and conflicts of interest. I have looked at how multiple industries — tobacco, pharmaceutical, chemical and food — use similar tactics to influence available evidence about their products, and the public's understanding of that evidence. Corporate interests have a history of shaping how consumers understand science as it relates to products. Often this is blatant, via funding of research that supports their position or product. Food-industry sponsored research typically focuses on single nutrients rather than overall dietary patterns. Its findings enable food producers to market products containing those nutrients as healthy. Such marketing efforts, backed by company-funded research, do not always serve the public's best interests. In administering an industry committed to self-regulation, the Advertising Standards Authority of Singapore relies principally on a system of guidance and voluntary compliance, rather than punitive measures, to facilitate observance of this Code. Effective enforcement therefore depends heavily on the support, co-operation, resources and obedience of participants in the industry. The Authority believes in the benefits of self-regulation, including the flexibility to resolve disputes and address concerns expeditiously and in an informal and consultative forum. • 1.1 All advertisements should be legal, decent, honest, and truthful. • 1.2 All advertisements should be prepared with a sense of responsibility to the consumer and society. • (e) Racial and religious harmony. • 1.6 No advertisement should bring advertising into disrepute or reduce confidence in it as a service to industry and to the public. • 1.7 This Code shall not intentionally suppress free and vigorous competition. • 1.8 This Code shall protect the rights of consumers. 8.1 Advertisements should not exploit the natural credulity of children or the lack of experience of young people, and should not strain their sense of loyalty. • 8.2 Advertisements addressed to or likely to influence children or young people should not contain anything that might result in harming them mentally, morally or physically. • 8.3 Advertisements should not promote a lifestyle that is promiscuous or that denigrates or is detrimental to family values. Most advertising in Australia shall be crass, sexist, fart louder than the next, devalue national assets, salute the rabid rightwing CRASS governments at every opportunities, promote fat food, fizzy drinks and adhere to the Alan Jones code to get the seal of approval — especially those with the word Kompressor in it.